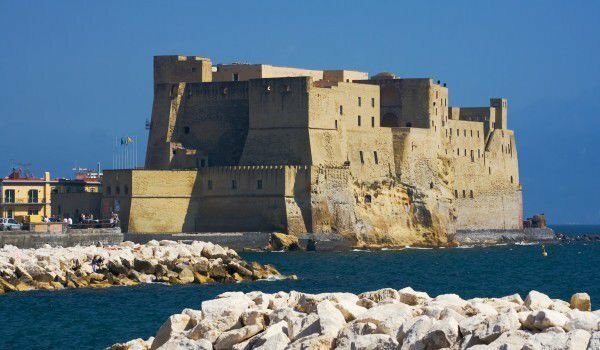 Castel dell'Ovo also known as Egg castle is massive and impressive medieval fortress, which is today one of the most attractive historical sites of southern Italy. The castle is located on a small peninsula in the past it was an island known as the island of Megaride. Castle dell'Ovo is one of the first things you see in the Gulf of Naples. Today the castle is surroundedwith yachts and restaurants, offering seafood specialties. The castle is also one of the most popular places for weddings. One intriguing says and explains that nickname Egg castle because of its architecture. The story tells how decades ago Romanesque poet Virgil, who was renowned for his wizardry skills, put in the foundations of the castle a magic egg and as long as the egg lies there, Naples will enjoy prosperity. The Megaride peninsula today is the first line of the coast of Naples and is a particularly attractive view, given the impressive structure of the castle. As an island Megaride, Cumae, laid the foundations of today's Naples somewhere around 6 th century BC. In the first century BC, the Roman Lucius Licinius Lucullus built here villa Castellum Lucullanum, which is the first massive building on the island. In 5th century Valentinian III builds a structure which in 492AD became a monastery, founded by the Roman biographer and chronicler Eugippius. In the ninth century, local residents destroyed the Roman ruins of the castle, to prevent it being used by the Saracens for their attacks. Todays castle was erected in the 12th century by Charles I of Anjou. He later built another castle nearby, Nuovo Castle. He also moved there, resulting in Castel dell'Ovo loosing its strategic importance and royal functions. In 15th century the castle had many changes, which remain to thid day. Sometime in the 18th century, around the eastern wall of the castle was built a small fishing village named Borgo Marinari. Today it is an attractive yachting area with many restaurants andexcellent Italian cusine. The castle is connected to the mainland by a 100-foot sidewalk with an architectural structure in rectangular bastion overlooking the sidewalk. Today some of the spacious interior halls are used for various exhibitions and events.